All this week, it’s the 2 Broke Girls 2 Fun Sweepstakes at 2BrokeGirlsWeeknights.com! You could win one of 10 trips for two on Carnival Cruise Line. 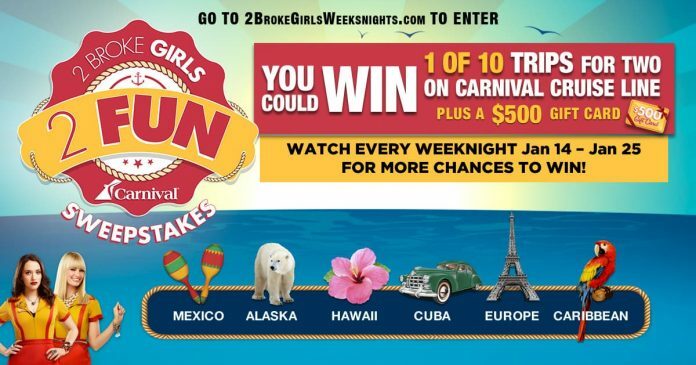 To enter, watch 2 Broke Girls five nights a week for the Destination Of The Day and text it to 76622 or go online to 2BrokeGirlsWeeknights.com. The 2 Broke Girls 2 Fun Sweepstakes is open only to individuals who meet the following criteria at the time and date of entry: (a) are twenty-one (21) years of age or older, who (only applicable if using text method of entry) have a registered wireless account with Short Message Services capability and/or wireless internet service, and (b) are a legal resident of and physically residing in one of the 50 United States or the District of Columbia (excluding Puerto Rico, Guam, American Samoa, United States territories, possessions, and protectorates, foreign based United States military installations and wherever restricted or prohibited by law). The Sweepstakes begins Monday, January 14, 2019, at 5:00:01 a.m. PT and ends at 11:59:59 p.m. PT on Friday, January 25, 2019. Approximate Retail Value of each Grand Prize: Two Thousand Dollars ($2,000.00). This Sweepstakes is sponsored by Warner Bros. Domestic Television Distribution, 4001 West Olive Ave., Burbank, CA 91505. Can’t watch 2 Broke Girls? Come back here daily for the new Destination Of The Day! Trying to find sweepstakes entry for 2017. The cupcake flavor for Oct. 6 is caramel vanilla. I love the 2 Broke Girls. Met Beth at a bar on Division. Email me bobiejay4@gmail.com… Lets met at Butches on Division.